Volkswagen’s 2009 CC was a collaboration between VW’s engineers and designers - and you can tell. From sleek exterior lines and the wraparound rear light arrays, to the super wide, almost frameless windshield and expansive sunroof, the CC is full of cool design details all meant to enhance the functionality and user experience of the car. Performance-wise, the CC was a pleasure to drive - it had great acceleration (it was easy not to realize how fast you were going) and was a smooth and quiet ride. The dashboard was intuitive and the entertainment system was very handy - with CD/DVD capabilities, SIRIUS radio, and a nav system that had a bit of a learning curve but worked well once you figured it out (including a live traffic feed that could suggest up to three alternate routes to avoid traffic). I appreciated minor details, such as how the car doors are actually frameless, with windows that automatically retract 1/4” when the door is opened or closed to get underneath a rubber seal - making for a nice and quiet ride. Other great features: the park distance control that flashes and beeps to warn you when you’re getting close to other cars (a common occurrence when getting out of our parking space - it’s been years since I last drove, living in NYC! ), and the rearview backup camera which works with the nav/entertainment system to display a video feed of the rear of the car, providing backup paths that are based on the position of the steering wheel. My favorite feature of the CC was the huge panoramic tilt sunroof - it really opened up the interior of the car and allowed lots of light in, and just enough air to provide ventilation without blowing a lot of wind around the cabin. The interior is finished with chrome and leather, including an option for a 2-tone color leather interior (I wasn’t a big fan, preferring the monotone black leather interior), with a nice contrasting stitching detail. All in all, the 2009 CC is a great entry-level luxury car. Green-wise, it’s on the lower end of fuel efficient cars, performance-wise, it is a fun car to drive, and design-wise it is well thought out, with a happy marriage between form and function. 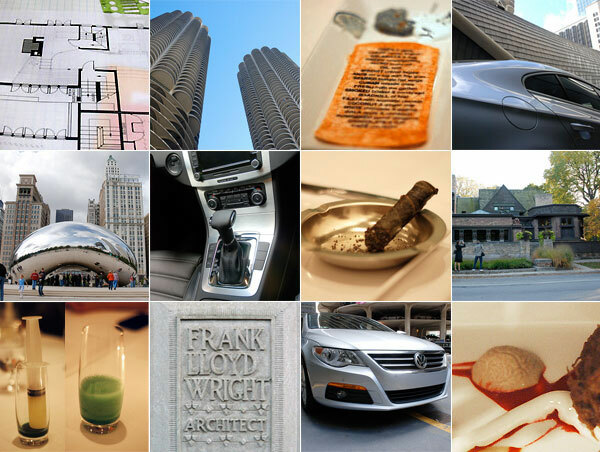 Our trip to Chicago wasn’t all work and no play (if you can call driving a car work!) 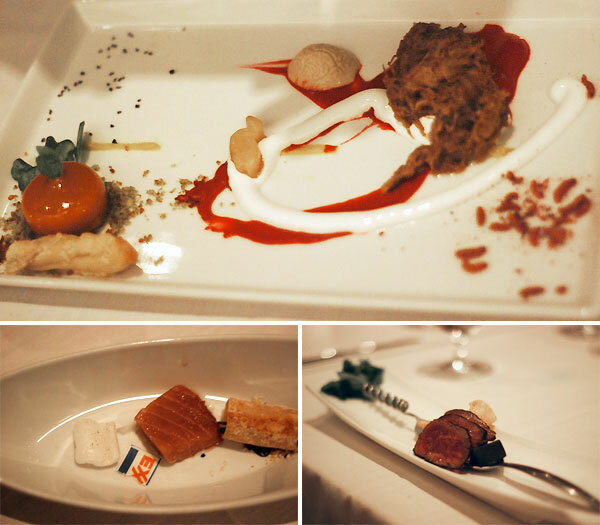 - Volkswagen also took us to Moto, the molecular gastronomy experiment of chef Homaro Cantu. Moto was super hush hush about their production techniques (obviously, I guess), which was a bit of a disappointment, as I think a lot of value would be added to the experience if you knew that it was cooked with lasers, frozen with liquid nitrogen and injected with helium (just guessing, folks!). Moto made a special edible menu for VW - using a flat chip as a base, the menu was created with a standard inkjet printer, using edible paper and food-based inks. The dinner was 20 courses long and delicious, with the occasional off-putting presentation (see the Cuban Missile Crisis, and the Road Kill of Fowl below!). An interesting dish that I didn’t get a photo of: a shot of greek salad that arrived in the form of a transparent liquid, but tasted exactly like greek salad. The Cuban Missile Crisis was served in the form of a half-smoked cigar on an ashtray. Not so pretty, but it tasted good. The CMC was accompanied by a seared “buffalo wing”, which was basically a piece of paper with the printed image of buffalo wings on it, seasoned on the back with a spicy powder. Not my favorite. 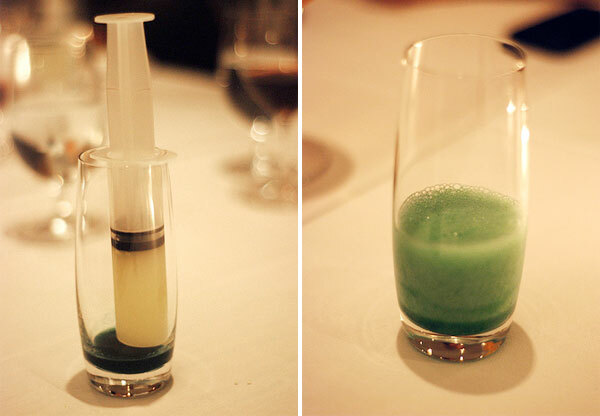 A virgin mint mojito served in a syringe was the palate cleanser for the Cuban Missile Crisis. Roadkill of Fowl, while not exactly appetizing in its presentation, was one of the better dishes and one of the most fun conceptually - a brain-shaped mushroom creme, shredded duck in a bloody beet puree with crispy maggots to the side and marshmallow. Yum! Oil Spill was a fairly literal commentary on the pollution we are causing to our oceans and included an edible packing peanut, an edible exxon logo, some tuna sashimi and squid ink that became the oil slick on your plate. The Fajita with aromatic utensils was essentially a deconstructed fajita - and a very tasty one at that! The steak was accompanied by a cube of pepper and onions, and the coriander in the untensil was meant to be tasted by your nose, rather than by your mouth. The exterior of his studio was ornamented and grand - there was no clear entrance in to the studio, forcing you to walk around to find a door, all the while contrasting his design style with that of the traditional houses across the street. You can see that the shape of the planter mimics the logo in the lower right corner of the cornerstone. Views of the home exterior and the entrance to the studio. 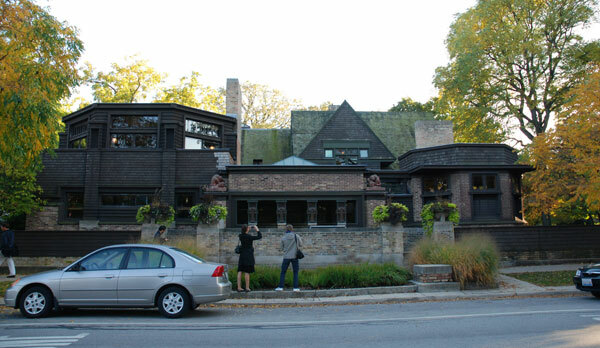 FLW’s work articulated strong datums and horizontal planes, even before he developed his prairie style. Details of the ornamented windows. We unfortunately weren’t allowed to take any interior shots. After the tour we took part in an architecture fantasy camp of sorts - the basics of drafting and design were explained to us, and we were given the framework of an empty apartment to design within. The architect in charge figured out quickly that Sean is a practicing architect and so asked him to come up with a non-obvious solution, to show everyone that there was more than one alternative to designing in a space. Sean drew up an apartment without any solid interior walls - using louvered walls and screens to divide up the space and provide privacy. It was a fun little exercise and a great end to an awesome trip…Thank you VW! More photos of the Chicago trip can be found on our Flickr account. Actually this label is not from a Cuban Cigars but rather from a Tampa made cigar with Cuban tobacco. To the contrary, if you do a bit more fact hunting, you will find the Volkswagen CC gets an impressive 30MPG. An accomplishment for a car in this class and family. So in all actually it is at the higher end of fuel efficient cars!